My friend Laura came for a visit last week to give me some advice on my vegetable garden. she brought me some of her homemade pineapple ice cream and a bag full of wild ramp leaves! Laura's soon to be in-laws have a house in Connecticut where ramps grow wild on the back end of their land. A first of the spring vegetables, ramps are a wild onion or leak and have a strong garlicky smell and a pronounced onion like flavor. If you can pick find them wild that is the way to go because they can cost anywhere from 8.00 -11.00 per lb. Ramps! ?Does anyone know where the ramps are?? I keep hearing about ramps everywhere but I don't know where to find them. A voice asked over the loudspeaker at the Park Slope Food Coop and then a dozen people scurrying to direct her to the ramps. It was hilarious. 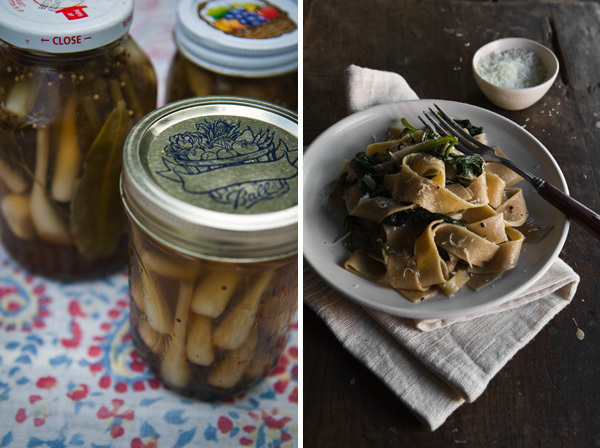 Laura picks the ramps, brings them back to Brooklyn and uses the bottoms to make her famed pickled ramps. Quite frankly, I did not know what to do with a ramp. Laura suggested sautéing the leaves like I would spinach. I then found a beautiful box of Pappardelle, made from Hard Amber Durum Wheat , grown & milled in small batches in California at The Food Coop. Together the wild ramp leaves sautéed with olive oil and garlic and the wheat Pappardelle made the perfect lunch, prepared with generous amounts of grated Pecorino Romano and freshly ground pepper. Bring to a boil a pot of water for the Pappardelle. Add a teaspoon of sea salt. Remove bottom white part of ramps and save for pickling or another recipe. Using only the greens leaves of the wild ramps, place them in a colander and wash thoroughly with warm water removing any dirt or unwanted critters. In a medium saute pan, over medium heat, swirl a generous amount of extra-virgin olive oil. Rustically chop two cloves of garlic, add to the pan and cook a few minutes. Add the ramp leaves whole to the pan. tossing when needed, season with a bit of sea salt and saute for about 5 - 7 minutes. At the same time your water should be boiling and you can add the pappardelle, cook for about 5 - 7 minutes or until al dente. When pasta is ready reserve about a half a cup of the pasta water and add to the pan with sauteed leaves. Drain pappardelle and add to the leaves. cook for another couple of minutes while adding generous amounts of freshly ground black pepper (using a pepper mill) and grated Pecorino Romano, stirring and cooking everything together. Serves 2 hungry people or 4 smaller servings. Love your recipe. 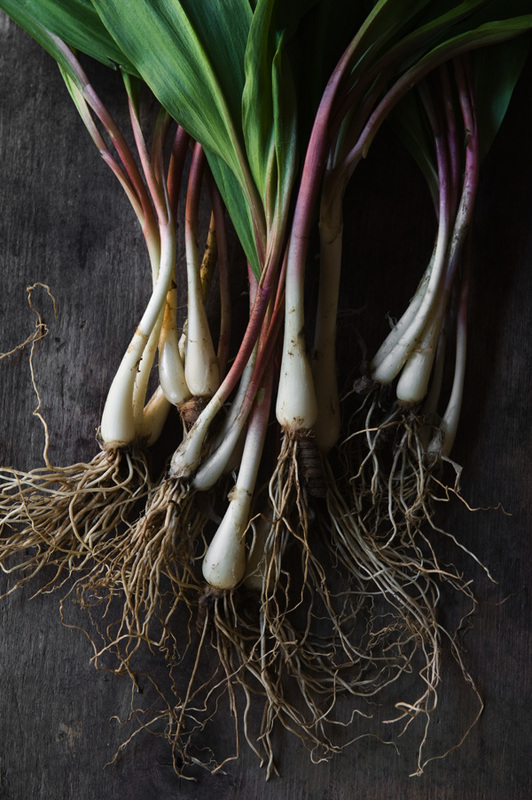 Ramps are such a fleeting spring treat. Thanks Diane! hope you got a chance to enjoy some ramps yourself this season. Your photographs are beautiful! I'm so glad I came across your blog. Very nice pictures! Wish I have this parpadelle now for lunch! So glad you both liked the recipe. 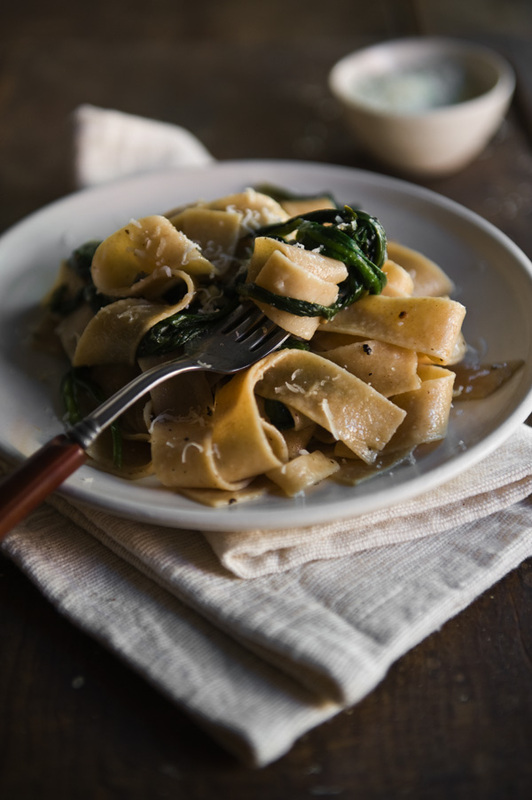 I suppose you could substitute spinach if you are making the Pappardelle this time of year and Ramps are not in season. 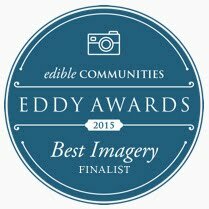 Eating Brooklyn was created by Valery Rizzo, a Portrait, Food and Lifestyle photographer born and raised in Brooklyn, New York, and shares food stories in and about Brooklyn. 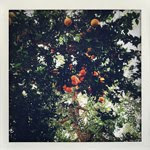 Inspired by seasonal and locally produced food, the stories are focused on her love of food photography, her interest in urban farming and a connection to all things Brooklyn, with an occasional Brooklyn Holga shot thrown in (from her Brooklyn book project). © 2011 Valery Rizzo. Simple theme. Powered by Blogger.